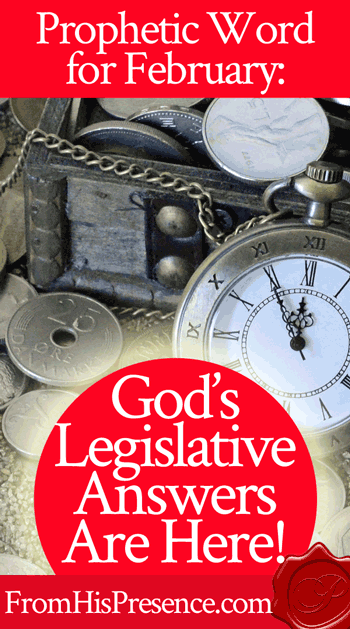 Prophetic Word for February: God’s Legislative Answers Are Here! The Lord has been talking to me about February 2017, and I wanted to share with you the four prophetic words for this month that He has given me. 1. Father has been hearing your big prayers, and His legislative answers are here. His ear is tuned to your big asks, and not one of them has fallen to the ground. Night after night, day after day you have poured forth the petition of your heart to His throne. Like the unjust widow of Luke 18:1-8, you have been persistent. In February, Father will reward your persistence. He will begin making His legislative judgments on your behalf. He has long delayed His judgments, as He prefers to pour out mercy. Even now, He will not release judgment upon His own people. However, He will make legislative judgments against this world’s systems and against the entrapments the enemy has sent against you to hinder and delay your progress. This month, Father will begin to make legislative pronouncements that will decide cases that have been waiting before Him. You will see decisive action on your behalf coming from the throne of grace and mercy in February. 2. Father’s legislative judgments on your behalf will bring swift favor to you. This month, a double portion of honor shall be yours, and you will begin to feel that the torment you have endured was worth it in order to obtain the blessings that will arrive. Of course, Holy Spirit is always our Helper. His help is always available. However, beginning in February, you will begin to see holy help at a level you have never previously seen. Believe Holy Spirit for His help in faith, the same way you believe Him to reveal and glorify Jesus. BELIEVE, speak, declare, and pray into the fact that Holy Spirit is your very present Help in trouble! Get to know Him as your Helper, and call on Him for His help! As you do this, you will see Holy Spirit answer your call for help in magnificent ways. His help will take care of you, provide for you, bring glory to Jesus, and He will flaunt His goodness–that same goodness that brings men to repentance–over all the earth. He will do this through you if you will submit to His work of grace in helping you. According to your faith be it unto you! 4. Buy the field! Buy the field! Buy the field! Some of us have found the treasure, but have not yet bought the field. In February, the Lord told me explicitly–urgently, as an nonnegotiable command–that each individual MUST buy the field. Every believer in Christ has his or her own field. Every son and daughter is called to serve the King uniquely, with his or her own gifts, talents, calling, testimony, and opportunities. However, no matter which part of the harvest field you are called to, you know that treasure is there. In February, it’s time to go all in and buy that field. Right now, a deal is on the table for you to buy the field of your harvest. You have the chance to buy the field in which the Kingdom is hidden. You can purchase the Kingdom treasure if you do it now. But you MUST act. You must buy the field the Father is offering to you. His gifts and His call may be irrevocable, but opportunity is not. Opportunity always comes with a specific window of time, and one must act decisively during that window of time in order to take advantage of that opportunity. In February, it’s time to buy the field. Do whatever it takes. Do everything it takes. Go all in, and don’t hesitate. Obey whatever God is telling you to do with haste. Abandon every lesser possession in order to purchase the field He has shown you. Only then will you be able to take possession of the greatest treasure. This month, you will see more supernatural help and greater answers to prayer than you imagined. Watch what God does with thanksgiving. Obey His urgent instructions with a holy hurry, and stand in awe as the Helper meets your faith and moves on your behalf! Does this word speak to your heart? If so, please leave a comment below. I’d love to hear if God is confirming something to you! Recommended resource: If you haven’t listened to my 21 Kisses: The Sure Mercies of David for Your Life teaching set yet, please. It’s a prophetic study of how God dumps mercy on His people. At this point, based on all the Lord has been saying to me and others in the prophetic community, I consider an urgent message. I RECEIVE IT! THANK YOU ABBA! I already knew, but didn’t believe…until now! Thank you for sharing! Very cool! Thanks for testifying, Rachel! And thank you for reading my blog! Thank you Jamie. When I prayed this morning with 2 other ladies for morning prayer in church; I received the word “this month the LORD is doing a new thing. HE is giving each of us a new seed that will grow and we’ll give birth if we faint not”. “Even in our churches do not hinder the perfect plan/will and purposes to be done as well just as how individuals also need the same walk with the LORD”. Amen, sister! Don’t faint! Persevere! That is the theme God gave my Christian group this year : behold I am doing a new thing. Love it! He absolutely is! I am always praying that with the help of the Holy Spirit, Papa will reveal to me my field of harvest. I know with God all things are possible. Thank you for sharing this word. I receive it!!! > The first time I did it I got a call about an hour later (a employment agency responding to my employment application), she was very excited, and asked me some questions, said she would return my call again, she did and told me the Employer would give me a call I must be on standby, – the call never came yesterday and I was down and disappointed. Sunday we have Covenant Service and I am going to Covenant again with the Lord, and wait for the Holy Spirit to show me which field to buy, and what task he assigns to me. Amen. God loves for His people to own land! I agree with your prayer for just the right land from the Lord for His purposes and your joy! In Jesus’ name! I quoted the same scripture to God this week concerning the widow woman, Luke 18: 1. You confirmed everything that God has heard my prayer and will grant it. God bless you for allowing God to use you. The field, my pastor passed out cards to our members to invite people to church. The harvest is plenty but the labors are few. I want to be a labor for God. Thank you Jesus! Keep allowing God to use you for your ministry will reach many. God bless you! Wow, Sherry. That’s awesome. So glad Papa used this word to confirm. Thank you for sharing! Yes Jamie, this word is confirmation, not wishful thinking..confirmation, Father had been confirming it all day even before I read your blog…listen very carefully with your ears turned south toward Florida you will hear an earth shaking shout of VICTORY, PRAISE & THANKSGIVING!! Stay blessed..? Thank You Abba for the confirmation! How your word has touched my soul. Please pray with me for the Holy Spirit to reveal to me and my family which filed to buy. As I know that I have a call on my life, but do not yet understand where God wants to use me. I receive in faith that the Holy Spirit will lead me and my family, as a unit and individuals, to our God ordained ministries. Praying for your device protection, blessing and supernatural provision. I will pray for you, Kara. I believe He will make it clear to you! Yes it does. I do like the swift favor. And I love that the enemy has been judged. What do you purchase the field with?? By faith?? I want to obey this commandment….How do I do this?? Great question, brother. Just pray and ask the Lord how you can give Him your all and commit fully to whatever it is He wants you to do. Pray Psalm 32:8 back to Him, and He will show you what to do. Praise God. WIth Swift Favor. Thank you Father for the Hidden Treasure I have been waiting for. I know that this month I will received my VA Compensation Claim. I will buy the field. You are AWESOME Father, Thank You. Amen. I was at work today and the Lord spoke a word to me today and I have no idea what it meant and really I kind of still don’t….but I think it and this word go together some how. He said….easement…. I never post on websites like this either…and I almost missed this as well as it wasn’t delivered in my inbox with the other messages either. Do you have any additional thoughts on this? iam humble for that feb prophetic. The word is about me and i thank God for confermation. God the Son, and God the Holy Spirit! Amen! May showers of blessings, of Favor, Divine Direction, and the Guidance of the Holy Spirit be given to, Jamie, from our Almight Father in Heaven! In the matchless name of Jesus, Amen! 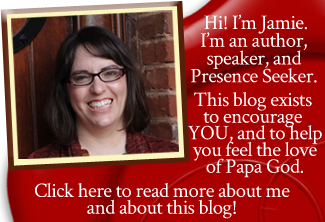 Jamie, I am so Blessed by your ministry, and blogs, please keep them coming Lord Jesus, I have grown more since I got involved with you, thank you so much, Thank you Heavenly Father. Thanks Jamie, this word has directly spoken to my heart. Thank you si much for sharing. Thank you, Jamie, for being faithful with the gifts you have been given. Two weeks ago Holy Spirit reminded me of a Bed & Breakfast property I had looked at two years ago. I immediately drove by the property to see that it is still for sale. I contacted the owners again and indicated my interest. During worship last Sunday He gave me Word that confirmed that He wanted me to purchase this property. I met with the realtor on Monday to walk through the property again. I am now contacting the owners for more information on the business operations. I have known that I was entering into the Hospitality Industry and I believed that it would be this year, but this property is in addition to another one that I expect to own by the end of February. He is certainly moving quickly. I can see how He is positioning me in the communities for the advancement of His kingdom. Please pray that He would orchestrate the communication between me and the owners and I am believing for the “swift favor” that is coming to me, in Jesus’ Name. Please also pray for clear direction as it pertains to the finances involved with the transfer of the property. His favor will bring the increase in land and assets and I will inherit the labor of the people! God Bless you richly, Jamie! I know what you saying is true, but my question is….how will be know? The past few weeks I have decided to start back into my sewing and hopefully to sell. I’m in need of the money. But is this what you mean? Something that we want, need, help with, etc.? My friends and I are sooooo tired of the stress of life and all the attacks. I pray that everyone has a blessed month, I think we all need some change and hope for the future. Awesome! Praising Jesus with you! Thanks so much for letting me know, Rosetta, and welcome to this Presence-seeking community!